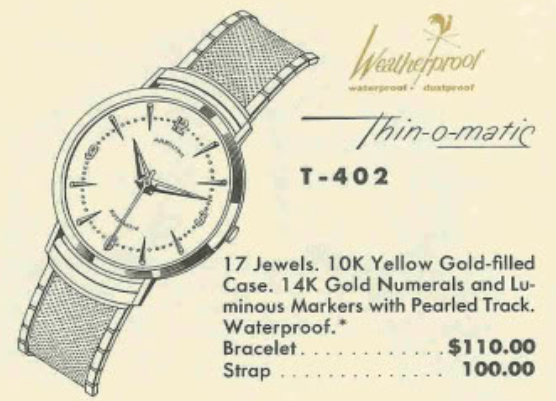 The first Thin-o-matic models were introduced in 1959 and one of the initial gold filled versions was the T-402. It would be produced through 1961. Although the model was shown in the 1961 catalog, it appears to have been "sold out". It's interesting that the price was changed to be the same for the strap or bracelet. The T-402 has a 10K yellow gold filled case and featured solid 14K gold numerals and markers along with a pearled track. 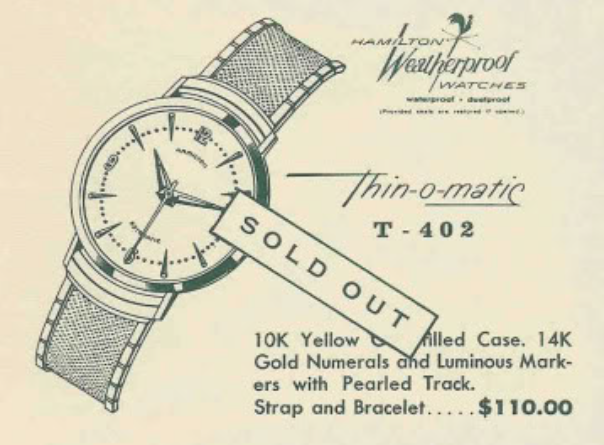 The first Thin-o-matics featured the newly introduced micro-rotor automatics that were made by Buren. Hamilton would eventually acquire Buren in the 1960's. The micro-rotors are arguably the most complicated movements in the Hamilton lineup. There's a lot that can go wrong with them. I recently came upon an interesting version of the T-402. It features the Budweiser Beer logo on the dial. I've seen this model before but this one was listed "in need of repair". Just looking at it, I can tell that it's in need of a second hand as well as a new crystal. Looking really closely I can see that there's no marker at the 8 position. Is it in the case? We'll find out. Not all Thin-o-matics have micro-rotor movements but the flat case back is a good sign that this watch has one. The crown came right off and did not appear to be in contact with anything. Notice it has a female portion of the stem attached to it. That implies the male side is in the movement. Often it's the other way around and the male hub is in the crown. With the crystal removed the dial appears to be in decent shape. It's a little bent at the 10 marker but maybe I can smooth that out. At least the finish is intact. So a little cleaning might go a long way with this dial. This may not be the dirtiest movement I've seen but it's arguably in the top 5. Notice anything unusual? There's a big empty space where the oscillating weight should be. This is a 663 movement. Here's a good reason for the crown coming off... there is no stem inside the movement. All that can be seen is an empty hole. There is evidence inside the case back that this watch had a rotor at one point... it must have gotten a little loose and rubbed the case. Micro rotors make a lot of noise in general but I'm sure the rubbing oscillating weight didn't improve things. Maybe it was removed to quiet things down. You can still wind the watch manually and a lot of people are of the opinion that micro rotors are a bit underpowered anyway. With the dial out of the way I can see that all of the necessary parts are still there. Why the stem is missing is a bit of a mystery. I happen to have a donor 663 movement and by coincidence it has a T-402 dial on it. Notice the dial is actually textured with an interesting spiral detail. You don't see that in the catalog depiction. I've used this donor movement for other projects but it still has lots of useful parts. I can use the oscillating weight for this project and also steal one of the hour markers to replace the missing one on the Budweiser dial. My donor movement also has a male stem. So I should have everything I need to get my project watch operational again. The solid gold markers are actually riveted on. To remove them you just push on the tiny circles where the rivets pass through the dial and then lift the marker off. I put all of the parts into a baby food jar with fresh cleaning solution. The jar then goes into my ultrasonic cleaner that is filled with water. The ultrasonic waves pass through the water and into the jar. You can actually see little bubbles form as the parts get cleaned. After 6 minutes in the ultrasonic the fresh cleaning solution has turned into a hazy cloud. Now I can remove the parts and put them in another baby food jar with rinse solution. After that I put them into a second jar with rinse solution and then all the parts are thoroughly dried. Everything looks bright and shiny now. There are a LOT of parts to this movement and it can be a daunting task to take one of these apart for the first time. Actually, the daunting part comes when you try to put it back together again. The reassembled movement is now ticking away. It's off to the timer to listen to the ticking. Well, it's running a little fast but that's easy to adjust. The amplitude is low but that's mainly because I haven't wound the watch yet. I just wound it a little to get the balance to move. Now that the watch is running I can install the replacement oscillating weight. There are six wheels involved in getting the motion of the rotating weight transmitted to the mainspring barrel. The crown on the watch is fairly worn and it's not a Hamilton crown. It appears to have a logo with two J's... maybe a Jules Jurgensen? Regardless, I will replace it with a new generic crown of similar size. A new crystal and fresh lume go a long way to brighten up this tired old Budweiser watch. Paired with a nice brown genuine lizard strap, this watch is ready for some well deserved wrist time. Great post as usual ! Thank you so much ! It's peculiar that the stem and the weight were missing. Where did you get the watch. My bet is that it was a donor movement in its previous incarnation. Q: Do you use water based clean and rinse solutions on these old metals ? I got it from and eBay seller. I don’t know what the history is/was. Maybe it was a donor or maybe it’s just had a rough past. Regardless, it’s back in action now. As for cleaning, I use L&R non-ammoniated cleaner and rinse. I just picked up a T-402 yesterday with the spiral dial. It sounds like the rotor also turns when I wind the watch --is this normal? No. It sounds like it needs to be overhauled. I see you clean the barrel while mainspring is in it. Is it your usual way? Do you lubricate the mainspring afterwards? If so, can you share how? Thanks a lot! Mainsprings in automatics have a spline that can be a challenge to reinstall. So I clean them in the barrel with all the other parts. The cleaning solution does a nice job of clearing out the old grease and dirt. Then I thoroughly dry the inside with compressed air and reapply mainspring grease to the outer coil and the rest of the spring. The grease spreads very easily as the watch runs. Thanks for your writeup on the cleaning process - when you mention your ultrasonic machine, is this a dedicated watch cleaning machine, or a generic ultrasonic jewelry cleaner? I'm looking to up my cleaning game without going all-in on a dedicated machine (even used they are pricey), and thought your solution might be a good intermediate point. Thanks in advance! No sooner did I post this then I found the same question already asked and answered over here: http://www.hamiltonchronicles.com/2014/01/tools-you-need.html. I would still be interested in the specific machine you use, as well as the cleaning / rinsing solutions and your experience with those - thanks! Nothing special... not the cheapest but nothing too expensive either. I use L&R 566 cleaner and No. 3 rinse.